The Elephant Baby Shower Wishes For Baby – Girl will go perfectly with an elephant themed baby shower. These well wishes cards are a sweet way for family and friends to give their well wishes to the baby. 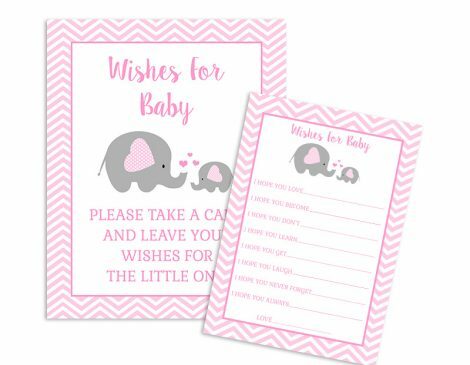 • The wishes for baby sign printable is 8×10 pdf file. • The wishes for baby card is 5×7 PDF file. File formatted to print 2 to an 8.5×11 sheet. • Files are in PDF format and you will need Adobe Reader to print.